The Roof of the Nave is the most interesting architectural feature of the church. This complex structure has had a chequered past and has been rebuilt or repaired extensively over the past 400 years. On the night of the 12th of December 1639, the church was struck by a violent storm that caused extensive damage to the roofs and possibly the East end of the chancel. The church seems to have remained in a derelict state until 1641 when, according to the Michaelmas Quarter Sessions of Charles I, the church was repaired at a cost of £500. The Nave Roof as seen today is the one rebuilt in 1641, but it underwent further repair and strengthening in 1937, when additional struts, braces and iron straps were installed. The Roof structure consists of five principal trusses which bear on wall plates. 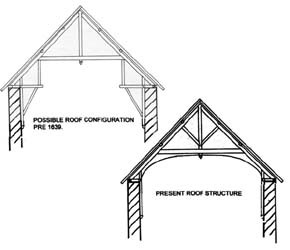 Between the trusses there are two purlins per Roof slope which support the jack rafters, and a mid purlin or cat beam. The entire structure is still held together ostensibly with timber pegs. Upon examination of the principal trusses, it is clear that they have been constructed from salvaged timbers from the earlier medieval Roof structure. All but one of the trusses have been totally rebuilt and it therefore seems likely that all but this one fell into the Nave in 1639. When the villagers came to rebuild the Roof, they salvaged the good quality timbers, reworked the smashed joints and re-erected the Roof in its present form. Apart from the principal trusses, there are other surviving elements of the medieval Roof that confirm the original design. Under the majority of the trusses and best seen on the North wall, are vertical wall posts built into the walls, supported at the bottom end by moulded timber corbels. Above the wall plates there are sawn-off timbers which would have originally jutted out into the Nave. These timbers are at the same level as a moulded timber cornice that serves no structural, or decorative purpose in the present Roof configuration. The main wall plates also survive, and exhibit well-cut halflap joints. The surviving vertical wall plate and sawn-off timber above give the greatest clues to the medieval Roof form. On the front face of the wall plate, there is a blocked up slot, which originally would have married up with the tenon on the end of a brace. The brace would have risen at about 45 degrees upwards to meet the now sawn-off timber above and would have projected into the nave. Although this surviving evidence does not prove the point conclusively, it would seem probable that the late medieval Roof was of the hammer beam form. This form of Roof is both complex and expensive. However, such Roofs were developed during the 14th and 15th centuries and, as the church was remodelled about that time, such a possibility must not be ruled out.